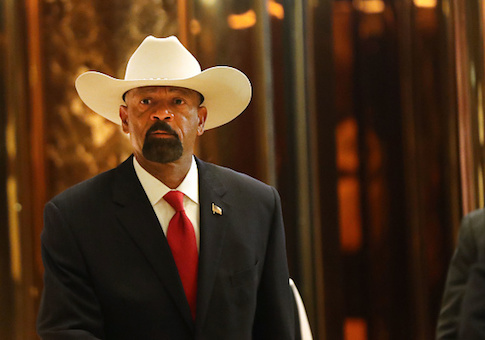 Sheriff David Clarke said his appointment at the Department of Homeland Security (DHS) is still on track, said it would require him to take a step back from the spotlight, and responded to criticism of deaths at the prison he oversees in an exclusive interview with the Washington Free Beacon on Thursday. Clarke announced he had accepted the position of assistant secretary of the Department of Homeland Security for partnership and engagement on Wednesday afternoon. A short time later, however, DHS released a statement saying an official announcement on the position has not yet been made. "Sr. positions are announced when made official by the Sec.," the statement read. "No such announcement w/regard to the Office of Public Engagement has been made." Clarke said the appointment, which does not require Senate confirmation, is still on track. "Everything in Washington, D.C., is a process," he told the Free Beacon. "The process is slow, the process is arduous. Sometimes it's one step forward and two steps back. So, I've got some loose ends to tie up. Hope to get it done soon." The role, Clarke said, would be that of a liaison between local law enforcement and DHS. "What it's designed to do is to be that entity that bridges what's needed at the local level with the Department of Homeland Security," he said. "The Department of Homeland Security is this big, massive bureaucracy and it's hard to navigate a big bureaucracy. What happens is it frustrates people at the local level whether it be local law enforcement, whether it be other local officials. How do you navigate around this big, massive bureaucracy?" "So, really, the job as a liaison is to find out what their needs are. This is about partnerships. We're going to be able to better protect this homeland when there is cooperation between state, federal, and local law enforcement entities." Clarke said local law enforcement often feel they're left out of the loop and ignored by federal officials. He said his experience as a county sheriff gives him the perspective necessary to bridge the gap between the two levels. "I'm at the local level," Clarke said. "That's where I've been as a sheriff in the City of Milwaukee Police Department. I've heard the complaints at the local level. Sometimes they feel that some of these federal bureaucracies, including DHS, they seem out of touch. They don't seem to really step up to the concerns they have. It has to be a two-way street: What can we do for you, and here's what you can do for us to bridge these gaps." Local law enforcement is key to success for DHS, Clarke said. Without them, the agency would largely be blind to what's happening on the ground. "You really have to make them feel like they're part of it, or they're going to turn you off," Clarke said. "What they think matters, it really does. If we're gonna be successful of meeting the mission of keeping the homeland safe, they play a big role. They're the ones with the contacts with people in the communities, in the neighborhoods. They have a wealth of information. We have information. We gotta do a better job with this exchange of information. That's another complaint from the local level. They complain that the information is just one way, it's just up. That information exchange has to go up, down, and across the entire enterprise and shared that way with easy retrieval. You know, protecting the stuff that's sensitive of course. But if information just goes one way, at the local level they just cut it off. They don't provide it anymore. They're at street level. DHS doesn't have the information, they have to rely on the state and local folks to provide them with what's going on on the ground." As soon as Clarke announced he'd accepted the position with DHS, critics attacked the move. Much of the criticism centered around some deaths at the Milwaukee County Jail Clarke oversees. The dehydration death of Terrill Thomas, which the medical examiner has ruled a homicide and is still being looked at by county prosecuters, is under particular scrutiny as a result of the appointment. Clarke admitted Thomas's death was "problematic" but said the backlash he has faced is purely political. "I'm limited as to what I can say with some of the stuff going on in the jail but those are political attacks," he said. "There's one death that's problematic. The other ones were natural causes. "The local media, they've spearheaded this thing, they're no friends of mine. They had to trump the numbers up, no pun intended. If it's just one, people look and go ‘it's an anomaly. Fix it, do what you have to do, hold people accountable, people have to answer for what they did, and let's move on.' So, they throw in these other ones, and they say ‘deaths in the jail.'" Clarke said deaths are something all jails have to deal with, and his record is better than most. "Deaths in jails across the United States have always been a problem," he said. "There's a county in Wisconsin that has had like nine suicides in the last two, three years. I haven't had, I believe I was told, a successful suicide in our jail since 2009, maybe? But, these things happen. We get a population that's in bad medical health when they come in. We don't get to pick and choose. We're not like a hospital that can say ‘that person's too sick you're gonna have to take them to a specialty whatever.' We've got to take them in. They require a lot of medical care because on the outside they're just not taking care of themselves. You're going to get deaths in jails. There's not one jail in the United States that's immune from it." He singled out the Milwaukee Journal Sentinel as a local publication that is "hell bent on destroying" him. "So, what I have done throughout my career is when you identify problems you go out and you fix them," Clarke said. "You make changes. You make corrections. You make improvements. But this has been turned into a political bludgeon by the Milwaukee Journal Sentinel, who is hell-bent on destroying my career and my reputation." Clarke stood on his record of reelection as proof he has done a good job as sheriff and the criticism of his performance is politically motivated. "You don’t win election and reelection four times if you're doing things in such a horrible fashion," he said. "But, you know, once you get to where I'm at in this political environment the attacks are going to come more often. They're going to come fast and furious. They're going to be more intense. That's what this is, and I've seen it. I know what's going on. I'm not unnerved by it." On Saturday CNN reported that Clarke had plagiarized parts of his master’s thesis. The sheriff then told the Journal Sentinel that "only someone with a political agenda would say this is plagiarism." Clarke sees similar motivations in the criticism that President Donald Trump has faced at the national level. "This is resistance, this is undermining the will of the American People," Clarke said. "The political theater going on in the Congress with all the investigation. I call it ‘the show.' It's very distasteful. It does no good. This is pure, raw politics. It's both sides. I'm not gonna to sit here and just attack one side. It's not healthy in our constitutional republic. Robust debate and discussion is, but these are political attacks. The president this morning called it a political witch hunt. It is a political witch hunt." "It's designed to distract the president from implementing his agenda: tax reform, health care. Those sorts of things that are important to the American people. The American people want tax reform, they don't want to hear about this crap about the Russians. These people out here are totally disconnected from the folks at home. I believe in this president. I supported this president early on. I still do. I worked hard to put him in the White House, and I'm going to work even harder to fight this deep state and this liberal media that have really mounted an attack against his presidency." Still, he said, he will likely have to do that fighting away from the spotlight as his new role will see him stepping away from the media appearances he has gained notoriety from over the last few years. He said he may also have to step down from positions at the National Rifle Association and other organizations should they take up too much time or present a conflict of interest according to federal ethics rules. "You have to take a step back which, to be honest with you, I'm looking forward to," Clarke said. "I've been front and center for 15 years. At some point it's nice to take a step back. Once this thing is wrapped up and it goes through, I will no longer be the show. You gotta know your role in these things. If Secretary Kelly needs me for a particular public thing, he'll let me know, but other than that I'm a role player." "Right now I'm the executive, I'm the face, I'm the show. I won't be the show at Department of Homeland Security. Secretary Kelly is the show. Donald Trump is the show. Members of Congress are the show. But I'll become, as an appointed, a public servant, and I have to understand what that role is. I'm gonna embrace it because it'll just be refreshing not to have to run with the ball all the time."